The Best of Germany begins with the sound of seagulls in Hamburg, a city that tickles tourists with its people-friendly harbor and a nearly Nordic vibe. From there you'll daydream through fairy-tale forests, meander the mighty Rhine, have fun storming the castle, and clink frothy mugs of beer in Bavaria. You'll also time-trip through the medieval charms of Rothenburg, walk in the revolutionary footsteps of Luther, reflect on the tumultuous events of World War II, and marvel at the modernity of 21st-century Berlin. Join us for the Best of Germany in 13 Days! Sale! Save $600 on new bookings! We'll meet at 5 p.m. at our hotel in Hamburg for a "Welcome to Germany" meeting. Then we'll take a neighborhood walk to get a feel for this prosperous, progressive city, and get acquainted over dinner together. Sleep in Hamburg (2 nights). No bus. Walking: light. Today we'll begin with a walking tour of the historic core of Hamburg, including the resilient St. Nicholas church, where we'll learn about "Operation Gomorrah" — the allied firebombing campaign that devastated the city in 1943. Then we'll stroll through historic Speicherstadt to the stunning new Elbphilharmonie concert hall. After free time for lunch, we'll hop aboard a boat to see the city's massive modern harbor. We'll return shore-side for a free evening to explore more of this pedestrian-friendly town. Boat: 1 hour. Walking: moderate. Today we'll take off for the countryside that inspired a thousand legends and visit the real-life settings where the Brothers Grimm did much of their fairy-tale research in the 1830s. We'll also stop to pay our respects at the site of the all-too-real WWII Bergen-Belsen memorial. Sleep in Lower Saxony (1 night). Bus: 3 hours. Walking: moderate. This morning we'll head straight for the single most-visited site in all of Germany: the Cologne Cathedral. You'll appreciate why as our local guide takes us exploring through northern Europe's most massive Gothic church. Then we'll continue on to the Rhine Valley and our charming riverside village where we'll have dinner together and sleep (2 nights). Bus: 6 hours. Walking: light. This morning we'll drive to nearby St. Goar, where we'll hike up the hill to tour the mighty medieval Rheinfels Castle, and enjoy its commanding view of the Rhine Valley. Then we'll board a boat for a relaxing Rhine River cruise, passing picturesque villages, vineyards, and feudal castles. After returning to Bacharach, we'll take a walking tour of the village with an entertaining local guide, followed by free time for dinner on your own. Boat: 1 hour. Bus: ½ hour. Walking: strenuous. Our day begins with a scenic drive to the Roman town of Speyer, where you'll have free time to explore the delightful architecture and ambience of this once-imperial city, including the largest Romanesque cathedral in Europe. This afternoon we'll continue our journey to Rothenburg ob der Tauber, Germany's best-preserved medieval town. After an orientation to town, the afternoon is yours to see the best woodcarving in Germany (Riemenschneider's altarpiece), walk the medieval wall, tour the Medieval Crime and Punishment Museum, or hunt down the best apple strudel in town. This evening we'll tag along on the legendary Night Watchman's tour. Sleep in Rothenburg (1 night) Bus: 3 hours. Walking: moderate. Today we'll journey along the romantic heart of Germany all the way to the country's most beloved fairy-tale fantasy: "Mad" King Ludwig's Neuschwanstein Castle. In addition to touring the castle, you'll have time to soak in its spectacular setting. We'll cap off our day with a scenic drive to Munich, an orientation walk through the city's historic center, and a "Welcome to Bavaria" dinner together. Sleep in Munich (2 nights). Bus: 4 hours. Walking: moderate. We'll spend our morning getting a behind-the-scenes look at Munich with a walking tour through its historic Old Town and learn about the "checkered" history and traditions of Bavaria at the Hofbräuhaus beer hall. The rest of the day is yours to stroll around Germany's most livable city, appreciate its world-class museums, or rent a bike to pedal the car-free paths along the English Garden and Isar River. No bus. Walking: moderate. This morning we'll drive north to Nürnberg, where we'll visit the city's Hitler-era rally grounds, including the Zeppelin Field and Documentation Center. Then we'll leave World War II behind, transporting ourselves back to the 16th century in the heart of Germany's "Luther Country." After checking into our hotel in Erfurt, we'll take an orientation walk through this historic town and share the day's insights over a hearty dinner together. Sleep in Erfurt (2 nights). Bus: 6 hours. Walking: moderate. Erfurt's half-timbered old town is the perfect place for a walking tour. We'll follow the footsteps of Martin Luther as he became a priest in Erfurt's cathedral and later a monk in its monastery. We'll also learn about the town's historic Jewish population at the Old Synagogue. Your afternoon is free for wandering through the picturesque pedestrian zone and market square, or to visit even more Luther sights in nearby Wartburg. No bus. Walking: moderate. Our final driving day begins with a stop in the city of Dresden, where a local guide will take us on a walking tour of this delightfully Baroque city, reborn from the ashes of World War II. Its star is the inspiring Frauenkirche, destroyed in the firestorms of 1945 and rebuilt with donations from around the world. Arriving in Berlin this afternoon, we'll learn how to master the city's public transportation system, and get oriented to our neighborhood before free time and dinner on your own. Sleep in Berlin (2 nights). Bus: 4 hours. Walking: moderate. We'll begin our day with a fascinating walking tour through the historic heart of Berlin, including Unter den Linden, the Brandenburg Gate, the Reichstag, Checkpoint Charlie, and memorials to the earth-shaking events and sacrifices of the past century. This evening we'll have our last dinner together, sharing travel memories and toasting new friends. Prost! No bus. Walking: strenuous. Breakfast is provided, but there are no group activities today. It's a breeze to reach Berlin's airports by shuttle, S-bahn train, bus, or taxi. You'll have easy connections to home, or on to other points in Europe. Auf Wiedersehen! Excellent trip! The first time I've done an organized tour. The first time I had been to Germany. "The talk Caroline Marburger gave us on the bus as we travelled into the former East Germany was a marvel. She is vastly well-informed and able to tie together historical perspective, thorough detail, integrated interconnections, and personal experience in a wonderful way. A priceless moment in a never-to-be-forgotten setting." Our first tour, our first time out of the states and we were not prepared to have all meet our wildest expectations. Each city had its very own character and it's own unique spot in Germany's history. Country is beautiful and clean. Our tour guide that accompanied us thru the tour and the tour guides in each city were knowledgeable, passionate about the country and personable. The food and hotels were lovely. Our bus driver was professional, fun and would love to have him on our next tour. "There was no one "wow" moment. Each location carried it's own "wow" moment." The tour was excellent, but we didn't realize how large the country was. I think that Rick Steves tours could easily divide this country in 2 or 3 or 4, and make some more wonderfull tours as they do in Britain, France, or Italy. The country has a lot to offer tell. "My favourite "Wow" moment was Erfurt. This was a town that feels like a "secret". Almost Germany's Brigadoon. Tourism is not its focus unlike Neuschwanstein which was a zoo. Erfurt has beautiful. Medieval buildings, squares, churches, and so on.The locals go about their day as if tourists weren't there. Erfurt has some nice pubs and restaurants where the staff are very helpful in navigating the menu. Often times they have a menu in English, but the buildings, and history is wonderfull." The tour was excellent. This was our second Rick Steve's tour. Saw so many beautiful places. We learned so much about the history as well as present life. Everything about the tour exceeded expectations, and I expected a lot from Rick Steves. The choice of sites, hotels, restaurants, local tour guides: I have no complaints, only complements. Our bus driver was excellent, friendly and professional. On one trip, when there was a reported accident, he spent his break mapping out an alternate route. Growing up during the Cold War, I never expected to visit what was then East Germany and Berlin. That was thrilling. "Wow moments? There were so many. Each stop was delightful. I lived in Germany in the summer of 1973 and remember being awed by the beauty and magnificence of the Cologne Cathedral. It was just as awe-inspiring this time around." Overall our tour experience was great! It was our first tour experience of any kind and our first trip out of North America. We were amazed by all the things we saw. The walking tours with local guides through each new town were both interesting and informative. We particularly liked the attention paid to the details about what the "specialties" of the area were, be it wines, cuisine, fashion, museums or churches. We felt well informed. "I most enjoyed the medieval city of Rothenburg, especially the Night Watchman's tour." This tour was much more structured than my previous Rick Steves tour. Group activities kept us on the go and consumed most of our waking hours. We had very little free time to plan for. That said the itinerary and the side trips picked by our guide were outstanding though very fast paced. I expect a Rick Steves tour to be slightly eclectic as you try to immerse us in the culture and I was not disappointed. The Concentration Camp and diary farm were particularly insightful. "Caroline was talking about how different generations did or didn't take ownership of the Holocaust. That brought back a flood of childhood memories of angst. I grew up in a family that embraced its connection to Germany. We also maintained close connections to German relatives that were clearly not freedom fighters against the Nazis. I couldn't fathom how my loved relatives could be part of a system that murdered the relatives of my Jewish friends. My faith told me we ALL own the Holocaust." Stellar tour as always from Rick Steves. This is our third and definitely not our last. "Erfort and Martin Luthers church." Torben is the best guide I've ever had. This is the first time I really feel like I learn about Germany from its real citizen. He gave us the first hand look at what Germany society is really like today. His wealth of knowledge in both American and German history past and present is marvelous. His sincerity shows in his conversation, in his demeanor and to everyone of us. Me and my husband really enjoy the trip! "Learning so much more about Martin Luther in Erfurt and the Walburg(?) Castle." It was our second trip with your operation. Overall experience was very good. The highlights are the knowledgeable guides, Torben in particular, also many of the local guides as well. "Munich Oktoberfest was one of the main reasons that we picked Germany and the tour date. It didn't disappoint. The festival atmosphere was very impressive. So many locals dressed up and attended the Wiesn. The rest stops on the autobahn are impressive too with the diverse food, drink, shopping, play and rest options. Apart from the paying toilet." This was a very well-planned tour. We saw and did so much in the 13 days. We had a great group of fellow travelers and I've made some new friends. I'm looking forward to booking another Rick Steves' tour. "Seeing the Church of Our Lady in Dresden. It was a "bucket list" item of mine." Having watched your show on TV for many the tour pretty much provided the anticipated experience. Some of the hotels were a bit dodgy, but this evidently is part of the "Rick Steves" experience. At times the tour was rushed as we had too little time for the ground to be covered. Bacharach was a disappointment. Much of the town was closed, including our hotel, on the Wednesday afternoon we were there. The town has seen better days and should be dropped. "Seeing the The Brandenburg Gate in person." It was all good Rick. Things went smoothly and everyone was compatible. I have been to Germany before, about 20 years ago. Some of the cities overlapped from my previous tour. Rothenburg, Munich and NeuschwansteCastle. Still it was nice to go back Hamburg was interesting; seeing the St. Nicholas church was an eye opener. The waterfront was charming and I enjoyed the boat ride. Munich was great: my husband and I love good beer and a fun atmosphere. Munich provided all of that and more. "I was born on the exact day/date/year that Bergen/Belsen was liberated. That makes me 73 and I knew that it was about the time the war ended. But seeing that prison camp really brought it home. Also Nürnberg. Seeing the "coliseum" style building and parade grounds that Hitler built was shocking. What a megalomaniac he was. Made me shudder and still sad to think of all the pain, suffering and death one man with a warped world view created." Having been on many previous RS tours, we were ready for a wonderful learning experience in Germany. Thanks to our guide, Holger, this trip surpassed my expectations as far as seeing so many different aspects of modern Germany as well as wonderful sites from its long history. That said, this tour was also more rigorous than we were expecting and some regular down time would have made it more enjoyable--getting to a new hotel at 5 PM and meeting for a walk & dinner at 6 PM is not down time. "While visiting the room where Martin Luther translated the Bible 500 years ago was probably the most significant moment, seeing the Neuschwanstein Castle in person after all these years was like standing in a jigsaw puzzle, and the walking tour of Berlin was a trip through the history of my lifetime. Wow!" This was an outstanding trip made exceptional but the extraordinary knowledge, leadership, attention to detail and support provided by our guide Holger. This tour (the best of Germany in 13 days) provided an excellent and efficient overview of key regions, cities, towns, and historical landmarks in Germany. The tour provided an effective balance between time in large cities like Hamburg, Munich and Berlin with time in small cities like Hannoversch Munden, Bacharach and Erfurt. "The tour also nicely balanced time at historical sites like Neuschwanstein, Nuremburg and Dresden. The food portions were large, the quality was suburb and we had nice variation across regions. The hotel accommodations were good and typical Rich Steve's style lodging. Each hotel was conveniently located in the core city areas. The transportation was excellent and lodging logistics were good. This is our 8th Rick Steve's tour and it exceeded our expectations. We highly recommended this." Our tour guide, Holger, was excellent! Would take another tour with him in an instant. He opened up Germany with its regional customs, political dynamics, Nazi history, rebirth as a democratic and prosperous Germany, and the quirks of the locals in towns very small and large, from Bavaria to Berlin. His personal care, attention to detail and constant supply of unique German treats along the way helped to create a Very Merry Band of Travelers, We! "Actually, my favorite "Wow!" was in gaining a strong appreciation of Germany and its people, as a result of our amazing 13 day tour. Secondly, my next favorite "wow" moment was the time spent retracing the steps and times of Martin Luther through Erfurt to Castle Wartburg, where Luther translated the bible from Greek to German while in hiding." This tour is a Germany smorgasbord. Because it's just Germany, it's easier to see the variations between regions. "From the tour specifically, I think it was the Berlin walking tour with a terrific local guide." I enjoyed the full tour experience, most everything fell into the "just right" category. Timing and stops were well planned and I never felt rushed or bored but very busy. It was a perfect balance of medieval, recent history and modern, just what I would expect from the best of Germany. If there is anything I could possibly ask to be different, it would be more German food. The food was great but it wasn't my idea of German, which could be my expectation was not realistic. "Hard to choose a single wow moment but I was would say I was surprised by my experiences with local Germans at the various memorials we visited." I enjoyed it a lot. The itinerary was a good mix of medieval towns and large cities. Side tours and stops were interesting and engaging. I like history. There was quite a bit I learned about Germany that I did not know on this trip. Our Guide was a good source of information as he was a German. There was a lot of walking and I enjoyed seeing castles and buildings up close. I love to take pictures up close. Our tour group was wonderful & lively This was my first trip to Germany. I will come back. "My wow moment hit me when we took our side trip to Wartburg Castle during our Erfurt stay. Seeing where Martin Luther studied in Erfurt, then hid out while he transcribed the bible into German and had thought about his 95 theses...well that changed the world for both Catholics and Protestants. What a great man he was and I had never really thought that much about it but it became very real being there where he had been." We lived in Germany 50 years ago, so this was a trip down memory road. We had seen a number of places since then, but we were able to revisit a number of places we hadn't seen for a very long time. It was a great survey of the places we knew so many years ago. It was a great pleasure to see the places again, even though some were now overflowing with tourists. Hamburg & Berlin were definitely the highlights for me. We visited East Berlin when the wall was up so the changes were amazing. "There was more than one wow moment, but viewing the Hamburg Concert Hall from the water and wandering in what use to be East Berlin behind the wall were the moments that were outstanding for me." You have done a very good job covering the highlights and interesting places on this loop through Germany. i really liked your Martin Luther stops and learning more about him, his life and his influence in changing the world. Thank you for including that. "Being in East Berlin. Staying in East Berlin was a plus. We wandered all along the areas where "the wall" had been. I liked learning about the "Stumbling Stones" and looking for them on our trip." I very much enjoyed this tour of Germany and felt it provided a complete overview of the country. The mix of large and small cities was good. Breakfasts buffets provide a means of meal flexibility for the rest of the day, ie. one can skip lunch if time is short. "My favorite wow moment was having lunch at the HofBrauHaus in Munich. The guide noted that this stop had been removed from the itinerary in favor of other restaurants, but it was one of my goals to visit the first and original HofBrauHaus in Munich. Yes, the food is perhaps not the best in Munich, and surely there are other quieter and cheaper restaurants, but the experience of being there with the band playing, and just once, holding a liter of beer in my hand was my Wow moment." Visiting Germany has been the number one thing on my bucket list for years and this tour did not disappoint! I would have loved to also visit Wittenburg. I enjoyed the guided tours in the 3 big cities, but I really didn't need any more time there, but I realize that is a personal preference and most people like the cities. . Visiting the smaller villages Bacharach, Rothenburg, Han-Munden etc were my favorite. Overall I loved my time on this tour! "Visiting the Luther sites in Erfurt and going to Warburg Castle! Neuschwanstein was also pretty awesome." We had a great time. No unpleasant surprises and the logistics were as advertised and expected We enjoyed the scheduled free time and the guided portions of the tour. "Two things stood out for me. The short Rhine River cruise was a bucket-list item for me. I might want to do a longer one in the future, but it was great to be on board during the time we had. Second, we loved the Berlin Wall Memorial, which we saw on our free time based on recommendations from fellow group members. Its strength is its strong interpretative material, particularly the stories about individuals trapped behind the wall, killed while trying to escape, etc." I had a wonderful time in Germany; there was so much to experience, learn and enjoy. The hotels, restaurants and tour bus were top notch, the local city guides were charming and interesting, and my fellow tour members were delightful people. Holger did a wonderful job leading my group, regularly checking in with us to make sure all was good. "Being in the former GDR had a profound impact on me, particularly Berlin with it's checkpoints and wall. Amazingly, national divisions can heal and walls can come down. It's a message of hope, really." Too busy. Needed more alone time. Tour seem very rushed. Did not need 3 castles!! "Visiting German war sites in Berlin"
The tour was fantastic. Caroline was an excellent guide and provided great guidance and historical context to the journey. I had never been to Germany and now I feel like I've learned a great deal about the country and have traveled to most of the important places, as well as some unexpectedly wonderful little towns. "It seems like there were "wow" moments every day of the trip. I especially enjoyed biking through English Garden in Munich, the Wine Festival (in a small town in Saxony), riding in the bus (with our wonderful bus driver Richard) through the countryside and learning about the history of each town and region. The trip consisted of a really great mix of big cities and small villages and each was special and endearing for different reasons." The R.Steves company is very well organized with well qualified tour guides. "I really liked the cruise on the Rhine River from Rheinfels Castle to Bacharach." It was our first trip to Europe, and I was so glad we chose the Best of Germany. I loved Germany from the first day. My weak ankles complained a bit about the stairs in Bacharach, that was a busy day of walking, but I powered through it. The weather was a bit warmer than we expected...but mostly, we had beautiful sunny days. Would have liked more time in Rothenburg and in Erfurt, but overall, it was a good mix of group activities and time on our own. Caroline was wonderful. "The whole trip was a wow moment for me." It was great to get an overview of Germany. It was especially pleasing to be able visit towns that I wasn't familiar with prior to the tour (Bacharach, Erfurt). As I was taking the tour, I started to think of it as a sampler. There was always more to do in almost every city than we had time to complete. Therefore, I started to think about cities I'd want to visit again on my own. "I would say the "Night Watchman's Tour" in Rothenburg. It gave a taste of medieval Rothenburg without romanticizing it. I'd be surprised if he hadn't read A Connecticut Yankee in King Arthur's Court by Mark Twain since his tour was very much in the same vein. We had some rain on our night which limited our mobility, but it was thoroughly enjoyable." Great tour! The Best of Germany in 13 Days Tour exceeded our expectations. It was an educational experience brought to life through actual field trips. Caroline was an exceptional tour guide. She had an in-depth knowledge of the political, economic, geographical, social and cultural history of the region. She shared her knowledge with us in a fun, informative and thoughtful manner. Caroline's extensive knowledge was supplemented by expert local guides. Great learning experience. "Experienced many "wow" moments. We especially enjoyed our visit to the Pergamon Museum which houses the Ishtar Gate and the Market Gate from Miletus." Amazed at how much I learned about Germany's people, history, regions, and culture. Appreciated the wide range of areas/attractions we visited with superb tour guide assistance. Our group was friendly and fun. Would highly recommend the tour to others. "There were many, but I would have to say that I was amazed at how Germany has protected its countryside, both farm and forests, without urban sprawl - much more beautiful than I expected. (Wow! number two is having observed how Germans seem less hyper and fast-paced than Americans). (Wow! number 3, if I may, would be my surprise how refreshing the Wiese bier is with a meal!)" I had such an amazing time on the tour. I saw so many wonderful sites and experienced such a wide variety of culture within the same country. I learned much history and was challenged to think about historical events from many different perspectives. The tour was the right length, we stayed in great hotels, and had very nice group dinners. I enjoyed the group of people we traveled with, and I felt well cared for & looked after by our guide. "WOW, there were so many! 1) Seeing all the beautiful architecture of the buildings & churches 2) Learning about the Nazi's & concentration camps & realizing that I was standing right where those significant events happened. 3) Following Martin Luther's path & seeing the Wartburg Castle & the Jewish synagogue. 4) Looking at Neuschwanstein from the bridge 5) Being in an actual beer hall in Munich 6) Night watchman tour was cool." Our tour guide, Caroline, is a history buff, and able to fill in so much of the "background story." Enjoyed the way that Rick Steves allows time for the group tour then allows for people to see and do things on their own. "the Sunday morning fish market in Hamburg. WOW! It was worth getting up before the crack of dawn to see & experience this unique weekly event." Exceeded expectations: 1. Small group size. 2. The introductory meeting fostered camaraderie with "buddy system". 3. Great choice of cities and sites. 4. Most of all Caroline's vast knowledge of history,her sense of humor and genuine care and concern. 5. Our driver, Richard: professional with a memorable personality. Overall this was a good travel experience. I enjoyed my fellow travelers very much. 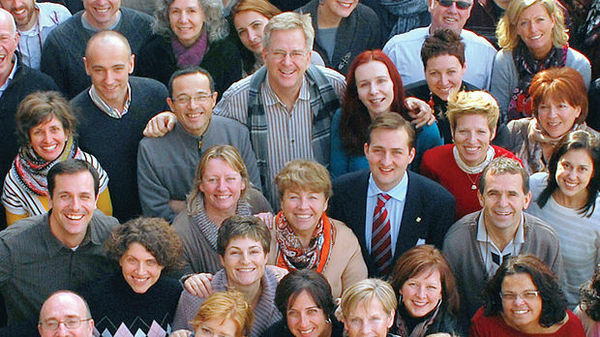 Rick Steves tour participants are an energetic group of inquisitive, thoughtful folks. The bus was comfortable and the local guides were very good and the smaller towns and sites were enjoyable. "Can't recall a wow moment. I enjoyed the Lutheran Church in Dresden very much. I wished there had been time to attend the service. Too rushed at times." "I only knew Nurnberg for the trials post war so was amazed at the Nazi Documentation Center and the path to power for Hitler and Nazis." "Basically was the guide Tobin which made the long hours of the bus rides memorable & entertaining"
I enjoyed this tour of Germany learning the culture, seeing all the beautiful and interesting sites. Following footsteps of Martin Luther was quite the experience. Torban was informative,energetic and made the trip interesting with all his knowledge, facts and stories. Great experience! "There were so many but seeing the Church of Cologne, N Castle, seeing the bust of Queen Nefertiti, all the museums, Martin Luther, Berlin Wall etc. It is hard to say one wow. I went to Wunderland Museum WOW!" "The night tour with the town watchman in Rothenburg am der Tauber." The tour was well. The tour included a very good balance of history including the Middle Ages, Martin Luther & the Reformation, German unification, World War II and the present day. The tour group members were great. Germany is a large country, so the tour did include a fair amount of driving on several days, but Torben's bus talks made the time pass by fast. "With the group, the Rhine River cruise was a nice scenic diversion from the mostly historically themed tour. On our own, the Residenz royal palace in Munich was spectacularly ornate." The tour really delivered on what they promised. Great and ambitious survey of much of Germany. Our tour guide and the walking tour guides (in each city) provided us with a great understanding of Germany past and present. "The 'night watchman' tour in Rothenberg. Also the memorial to those murdered by the Nazis in WWII in Berlin." We had a wonderful tour. Torben Brown is a terrific guide, and all his little extra treats were much appreciated by everyone on the tour. Every day seemed to bring something new and interesting to see. "Neuschwanstein castle, even in the rain, was amazing. We had looked forward to seeing it as part of the trip and were not disappointed." Our tour was very-well planned and very comprehensive especially with regards to German history. The travel distance between stops was good. "I did not have a favorite "wow" moment. The Cologne Cathedral was amazing and Neuschwanstein was spectacular even in the rain. But reflecting on my experience, I would say the German's ownership of WWII and all the memorials and centers that they have built not only to commemorate but also to educate future generations." "The many monuments to those murdered during World War II are poignant reminders to us all. Germany seems determined never to repeat the mistakes of the past. The peaceful, beautiful town of Erfurt and the monastery where Martin Luther studied and the picturesque Wartburg castle where he took refuge were particular favorites. My Lutheran faith is stronger and more personal since I have walked in his footsteps.The ancient city of Rothenburg and the night watchman tour was delightful!" This was my first Rick Steves tour and I was very impressed with the overall experience, the cities and towns on the tour, the hotels, the local guides, the amount of free time we had each day to explore on our own, and especially with our tour guide Torben. He was so knowledgeable, provided an incredible amount of information (historical, current events, and cultural), and was very helpful to everyone in the group throughout the 13 days of the tour. "My favorite wow moment would have to be spending 2 nights in the town of Erfurt - it was such a pretty town that felt so untouristy and very walkable." I think the time is wisely used and allowed adequate free time to do things in our own pace. Our group get along well, nice group of people. we also helped each other fining things and ways. Torben is patient in explain how to get to places with subway- u bahn! "Love the underground tunnel adventure in St. Goar - what is that castle name? Liked the tour guide. The Holocaust tour is so sad but necessary." The tour was very good and informative! I enjoy the tour very much? "The welcome and farewell party went very well!" As usual, what helped to make our tour a positive experience is that it wasn't overly crowded. We had 24 tour members, which is just the right size. As a public school teacher, I am well aware of how a group's dynamic can be affected by over-crowding and I am very appreciative that you keep the tour group to a manageable size. Our tour guide Torben Brown was excellent! His mastery of the history of Germany and his informative lectures on the bus helped to enhance our visits to various sites. "The Bergen-Belsen memorial was very moving and emotional, and Munich was warm and friendly; however, I think that the beauty of Dresden is what I will remember most. I was struck by how much has been rebuilt since the firebombing in 1945 and enjoyed our look through the Staatliche Kunstsammlungen, where we saw works by Van Gogh, Rubens, etc." germany was interesting. our tour guide was very good with information, personality, patience, humor, and answering questions and general helpfulness. the fact he lived nearly half his life in the u.s. and the rest in germany made him especially qualified for a tour with almost all american citizens. he never checked notes and knew his subject from start to finish. "maybe the boat trip down the rhine in bacharach. there wasn't a wow moment such as cinque terre or the roman coliseum. it wasn't that kind of trip. it was more an informational trip with heavy emphasis on world war 2, which there should have been. the beer gardens were interesting and so was east germany's recovery. the scenery was quite good riding the bus." The tour did an excellent job of delivering on all that was promised. I especially liked: the balance of big cities and quaint towns, scheduled tours and free times, group meals and those on our own (with suggestions from our guide). I enjoyed every place we stayed, location and hotel. Our guide was fantastic as were our traveling companions. I learned a lot about German history, culture and world view. "Difficult to determine a single "wow" moment. However there was not a single place we went to that I was ready to leave. Erfurt was a delightful surprise, Munich was friendly and comfortable and I could have spent at least a week in Berlin - all "wow."" This was our 6th trip with Rick Steves and we were not disappointed. Our guide was superior, the bus spacious and comfortable, the driver competent, and the itinerary varied and well thought out. The hotels were wonderful, especially Berlin and the delightful Munden. The wifi left something to be desired at several hotels, but overall our trip was enjoyable, meaningful, educational and FUN! "Rothenburg. Oh, my. I needed to stay until Christmas. The "wow" moment was walking back to our hotel after dark with my husband, looking up and seeing an almost full moon in the sky above gorgeous medieval buildings. I took a photo never thinking that it would come out, but like magic, it replicated the moment. I will treasure that for a long, long time." There were many things that we can take into account that made this family trip successful. The tour guide (Torben) and the people that toured along with us were exceptional. Learning about the history, experiencing the culture, and seeing all of the amazing sites and views of Germany were second to none. We highly recommend the Best of Germany in 13 Days Tour. "There are many outstanding tours and sites that I saw on this trip, but I would have to say that the Rheinfels Castle tour and the paddle boat ride down the Rhine was outstanding. The Neuschwanstein castle view can take your breathe away. Spending time in the world famous Hofbrauhaus in Munic was my goal that I accomplished. Never disappointed throughout this trip." We loved Torbin, he shared so many insights about Germany. This tour was simply phenomenal! Along with its breadth and length, the tour was made perfect by the astute and extremely knowledgeable guide (Torben), who infused vibrancy and life into the tour with his immense knowledge of German history and socio-political issues, both past and present. The destinations and events were carefully chosen and just outstanding. "The ongoing commentary and history and relevance to past and current issues made this tour a once-in-a-lifetime experience. As for a particular destination, the Rhine valley was out of this world!" The trip was an excellent overview of different parts of Germany. We got to see just enough of each area to make us want more. I feel there was too much time on the Bus. Hamburg was nice but way too far from the next stop. How about using trains for long stretches. Bergen Belsen could have been skipped for more time in a town. The Vox headsets were fantastic. I hope all your tours use them all the time!!! Nothing worse than being in the back of the with city noise trying to hear the guide. "The view of Neuschwanstein from the bridge was like a fairy tale picture.The weather was perfect with just a few puffy clouds. It was everything it was built up to be." This was such a fun & pleasant journey! We walked & walked some more; I never felt pressured, or had that "not enough time/keep moving" feeling. It was almost "laid-back"-a truly relaxing vacation where I learned, explored & had a lot of fun. Good group of people: no "cliques" formed, everyone, incl. Caroline & Katie (& John) chatted with, ate & drank with, sat with & had fun with everyone else. Bus: too big, no WiFi/ports. Poor John: some people used bus WC-Yuck!Even w/freq stops! "Surprisingly, the moment or "event" I find myself remembering & chuckling to myself about was the boat cruise in Hamburg. I learned so much about shipping & those huge container ships. The Local (Boat) Guide (Martina?) was so funny! Her English was great, her accent was easy to understand and she had such a great, dry sense of humor. I never knew learning about shipping could be so fun! I, also to my surprise, thoroughly enjoyed the town of Erfurt! So walkable, so lively, I could move right in!" Overall tour experience was very good. I had an enjoyable time meeting new friends and learning the diverse history and culture of Germany. "Nurnberg. Visiting the Nazi Documentation Center and the Zeppelin Field. Two places I've read about in my history studies/reading. To set foot on the same ground that made such history was rewarding." Our tour guide, Ms Caroline Marburger, proved to be an excellent teacher of everything German - history, geography, art, music, politics, religion, contemporary issues, etc. Her presentations on these issues while touring each city and traveling on the bus were the equivalent of a high quality college seminar. Itinerary, hotels, local guides, and bus transportation were all excellent. What a great experience! My son and I took this trip looking forward experiencing Germany and learning more about its history and culture. It did not disappoint! Our tour guide and local guides kept us learning the entire trip. "My favorite experience from the trip was being in Erfurt. Like many places in Germany it is so rich in history, but it was away from most of the tourist crowds and a place where I felt I could blend in with the locals while I explored the old town. I returned to the Protestant Monastery of St. Augustine where our morning tour had taken us and was able be alone in the church. Amazing." "I had no one wow moment. Too many experiences qualified for a "wow." Hearing and seeing Germany's reckoning with its past was my "wow."" Torben was a great guide. He was very knowledgeable, available and approachable. Torben made sure that everyone was happy and provide for he had a good sense of humor and I would recommend him to anyone who was interested in a tour to Germany. "My husband and I met two local young local women in Erfurt and spent the evening talking with them and sharing a bottle of wine." I really enjoyed seeing Germany. Our guide, Torbine eve us a really comprehensive view of the country, the people and their rich history. As a photographer, I liked watching the people.in every day life, doing their thing, drinking beer, enjoying a soccer game in beer gardens and pubs on the streets of Berlin...enjoying the the warmth of summer. "I had two wow moments. the first was from a fellow tour member, a trumpeter and band leader, who taught us a German drinking song. Together we sought out a really small pub in Munichand sang Bavarian music in a packed house filled with music and laughter! My second wow moment was running into a couple of locals, Claudia and Anja, who shared possible places to dine, as well as wonderful tidbits about the town! We even shared conversation and a bottle of rosé overlooking the town!" This tour ended up being my favorite Rick Steve's tour so far. "My "wow" moment was learning about the German history that isn't taught or talked about." This was our second Rick Steve's tour and we had a blast! "Erfurt was an absolute delight. As a Lutheran, the Martin Luther experience was one I'll never forget." "Neuschwanstein Castle - I loved seeing such a spectacular Castle and learning about Ludwig II. It was well worth the crowds of people in a touristic spot. I really liked all the castles we saw in Germany. My other Wow moment was Hamburg. Loved the town. We really liked Bacharach and St. Goar were we visited the castle. I wish we had had a little more time in St. Goar. There were some unique stores we wanted to see, but didn't have the time. I would have liked to have helped their economy!" Great tour exceeded expectations. It was clear that the itinerary was carefully chosen for a good blend of small towns and larger cities with an emphasis on interesting and meaningful experiences. Our guide, Torben, was very knowledgeable and engaging, with a gift for connecting the past and the present. We also lucked out with a most hospitable group of fellow travelers. What more could you ask for! "Many moments and memories: rubbing elbows with locals at the "Yodeling Innkeeper" bar in Munich; exploring less-touristed but still charming cities such as Erfurt and Hamburg; listening to the droll tales of the Night Watchman in Rothenburg; seeing firsthand Germany coming to terms with its not-too-distant past; sharing a drink with two local women in Erfurt who were passionate about their city; being blown away by the Ishtar Gate at the Pergamon Museum in Berlin." "visiting the castle close to Bacharach"
"Don't really have one. Very much enjoyed the whole tour"
"There were a lot. I loved the walled city of Rottenberg and of course the Neuschwanstein castle." The tour was a wonderful introduction to Germany. "Visiting the Reichstag in Berlin." Fabian and his assistant made the trip great. Hotel locations were great. Great guides (thank you Fabian and Maisie), great group, fascinating and beautiful country. I feel like we were given a very, very good overview of the history of Germany, with the good and the evil. And the tour covered different regions with a taste of life in small towns and large cities. All of the local guides were excellent and enthusiastic about their areas. It was especially interesting to hear the after effects of the Nazi period from so many perspectives. "Very hard to pick one out, but Erfurt was perhaps my favorite town." This was our 10th RS tour. Impression was that we attempted to cover too much territory during the allocated tour time. This resulted in multiple days where we had to eat lunch "on the run" or in a freeway stop (compared with other tours where he had time for a more leisurely lunch). While I realize that Neuschwanstein is one of the top German tourist attractions and the surrounding area is beautiful, I don't think it was worth essentially spending a full day to get there for a 25 min tour. "Hamburg (which you don't hear much about in the States) really impressed us. Especially the warehouse district, the harbor and the new concert hall. Impressed with regard to how much change in Berlin since we were last there 10 years ago (on our 1st RS trip). Additionally, blown away by how the guide in Bacharach personalized the tour with family stories and antidotes concerning Nazi times in the town, and the story of the previous Jewish owners of his family's home." Great tour guides! Worked very hard to provide good experience and iron out little hiccups along the way for everyone. They both interacted well with all of the tour guests . Especially liked commentary on the bus and letting us sample the local food items from different places. Torben was effective at keeping the atmosphere light at times and in contrasting life in Germany with the USA. Caroline went above and beyond ( even after the trip ) for one tour guest. "So many different moments, but I enjoyed Berlin and the Erfurt best for different reasons. Berlin has world class museums and so much history . Erfurt was a gem because the city center was full of unexpected interesting places and experiences." We had a wonderful trip all through Germany, with a great group of people and the two best guides ever! This was an excellent tour. Torben could not have been a better guide, and the group was delightful. We saw and learned a great deal about Germany, such that I am eager to return and feel confident that I could tour in depth some of the places we visited without help. "The beauty and charm of Bacharach, including the hotel and the hiking trails behind the hotel." Both guides very helpful, well informed and did outstanding job of explaining German History, culture and politics. Driver was also very helpful, very safe, felt well cared for by all staff. As usual we had no grumps, what issues that did come up were handled in a courteous way. Was very impressed with attention paid to minor medical issues of 2 tour members. Caroline went way beyond expectations in securing medical attention for one tour member. Local guides were mostly excellent. "Watchman tour in Rotenburg. Very entertaining." I enjoyed Berlin and the trip down the Rhine. "Not a good "WOW" moment was Rothenburg. Horrible place way to crowded. Felt like Venice when the Cruise ships come into town. Tourist trap - Food was bad and prices were to expensive. Disneyland at it's worst. Should have spent more time in Dresden, Bacharach, Erfurt, instead of Rothenburg. The thing that makes R Steve's different is that they do not spend to much time at Tourist traps." We saw so much of Germany, three major ciities, and wonderful small villages. I learned an incredible amount about history, culture, relligion, and current times thanks to Torben and the local guides. Our tour group was diverse, and we got along with one another extremely well. "It was such a great tour that choosing one is difficult. I wasn't planning on it, but as a life-long Lutheran I had a thrill sitting in the chapel in Erfurt and noticing the rose that became part of Luther's symbol, and learning at Wartburg about his influence on the German language. With all that we learned about German history leading up to and including World War II, we found the Nazi Documentation Center in Munich, which my husband and I went to on our own, particularly informative and"
Very well planned and organised. Gained excellent insight of German culture and history. The tour guide Carlos and the tour members were the best I had. "The quaint town of Munden! Straight out of a fairy tale." Our guide Carlos and driver Rony are both exceptional, and I feel very lucky to have had them. The tour was balanced among the historical (medieval, WWII, Soviet Union), scenic (Rhine river, forests, castles, farm land), and current life in Germany. Every local guide put his/her heart and soul into sharing that aspect of the tour--as though it was their first time talking! Allowing each person to have his/her own seat on the coach was a great luxury and made for increased comfort. "I can't list one. Rhubarb strudel in St. Goar! Learning how strategic and scripted the Nazis were in gaining public trust (Nurnberg Documentation Center). The balance of included vs. independent time and meals. The number of charming medieval towns with timbered buildings. Learning about the thousands of volunteers who've supported the refugees as well as those on the other side politically. Being delighted in Munich with music at dinner. (I've run out of space.)" Tour was awesome and exceeded my expectations. Itinerary was very well thought out and the time spent in each stop was perfect. I felt like we saw as much as we possibly could in the time allowed and liked the fact that we went to places where we didn't see a lot of fellow tourists. I also felt i was experiencing the real Germany with Carlos and the local guides that we had and felt more personally immersed in the history, culture and local flavor than a more generic tour would offer. "Honestly every stop had it's own wow moment! I was really in awe of Carlos and his personal attention to all of us (local snacks included!) as well as our farewell dinner and individual awards he presented. I was also wowed by the great group of people on our tour and the comradery we developed." Team Germany from May 19th through May 31st was awesome. This tour was one of the best experiences I've ever had period. Carlos Meissner is extraordinary, and the [INVALID]ion of tour guides in Hamburg, Munden, Bacharach, Munich, Erfurt, Dresden, and Berlin were all beyond my expectations. The value of a Rick Steves tour group far exceeds independent traveling. I loved every minute of this tour except for the "Truth and Lies" buddy introduction in Bacharach. "I had a "wow" moment every day on this tour. If you want a vacation, then take a trip to the beach in Florida. If you want to really travel and experience what a beautiful country such as Germany has to offer, then take a Rick Steves tour with Carlos Meissner. Germany is a gorgeous country, with a rich history and you learn about this rich history on a Rick Steves tour. To say that there is "one" moment on this tour that stood out would be very difficult." Enjoyed learning about German history and what current German culture is like. Enjoyed the mix of seeing both large cities and smaller towns. Architecture was awesome, and would consider visiting several cities such as Hamburg, Munich, and Dresden. I must admit that, because we had some hot days during the trip, I got tired of staying at hotels that did not have air conditioning, nor ceiling fans. Getting a good nights sleep will be high on any future Rick Steeves tours. "I would say that my overall "Wow" was our trip guide Carlos. I can't imagine a better tour guide. His knowledge of German history is to be commended. He was perfect in every way. In any possible future Rick Steeves tour I would seek his tours." I found the trip an excellent and convenient way to explore a country I'd never been to before. We enjoyed the smaller, out of the way hotels and every one of the cities and sites we visited. Having a local guide at most of the cities provided an additional level of information that I had not anticipated. A very good trip. "Hmm. I think it was when we were staying in a little town. We had a room with a balcony that overlooked the cobblestone street. I noticed that the house across the street had been built in 1099! Wow, old stuff, something there's just not much of in the US." This was our first guided Rick Steve's tour (we had done My Way Spain in 2015) and it exceeded expectations. The most significant factor contributing to our outstanding experience was our guide Carlos Meissner. He was knowledgeable, organized, helpful, and a delight to be with. The tour itself was jam packed with great experiences and kept a very busy pace. The immaculate cities and beautiful landscape of Germany were all memorable. "While the tour had many "Wow" moments, one that stands out is the approaching walk to Neuschwanstein Castle, when out of the woods appears Cinderella's castle!" Germany was great, Hamburg was more than I expected , the museums the the food , easy to walk around. good start . While the bus rides could be long ,just being on the autobahn was fun. Carlos would give great commentary along the way, and get us prepared for what was next. I enjoyed staying in and exploring the small towns , I really like the use of local guides it adds depth to the experience.Enjoyed going thru eastern Germany never thought that would happen. it was all wonderful good time. "The cruise on the Rhine was great, going past all those robber baron castles lots of fun." Great tour, outstanding tour guide (Holger) and some fascinating experiences. Germany is an interesting and varied country and we saw some of the best parts of it. "Most impressed with the way the Germans have come to grips with their role in WWII. They have erected some touching and memorable monuments to those who suffered terribly and written pointedly of their part in this terrible war. Loved the Night Watchman tour in Rottenburg! Totally surprised with the beauty of Hamburg." This tour exceeded my expectations. We received an excellent view of present day Germany as well as its past history: both the good and the bad. We saw a great deal of the country from Hamburg on the North Sea, to Munich and Neuschwanstein in the south, and to Berlin in the east. We ate lots of great food and managed to walk off most of it. "My favorite wow moment was driving into the medieval town of Hann.Munden. It was the first of four medieval towns or cities we would visit: Hann.Munden, Bacharach, Rothenburg and Erfurt, all with great charm, interesting architecture, churches, lively street life and unique histories. However, Germany's big cities were exciting too." Very well organised.This is my fifth time travelling with the Rick Steves group.Well balance schedule between free time for self exploration and group activities. "Every day is a "vow" day. The Rhine river cruise is my "vow" moment.."
This tour was an excellent overview of the diverse cultural and geographic regions of the 1990 unified country of Germany. The combination of a well planned itinerary with the leadership of Holger Zimmer insured a wonderful and efficient exploration of the cities and small towns of both the former West and East Germanys. I appreciated the history lessons while transiting from one stop to the next and the available free time to explore each location on our own. "Our visits to sites from all the major time periods brought history alive. One can read about from a book and study the characters and locations of the famous events but it takes walking in the footsteps of those historical figures in the actual locations to make it real and begin to connect the dots of their significance." Great overview of a complex country with a difficult past. Good mix of historical, political and cultural sites. Wonderful group of traveling companions led by an excellent guide. Overall very good. Holger is a tremendous guide, and Germany was covered quite completely. Important high points were covered. I felt I really learned Germany well. The local guides were very good, but the very best local guide of all Was Jim in Berlin. The guide for Rheinfels Castle was also superb. Holger maintained his zeal and enthusiasm. "The Tour of the Night Watchman in Rothenburg. Next was the Rhine River cruise. Next was Neuschwanstein Castle. Then Erfurt. But also highly meaningful tome as a Christian was the room at Wartburg Castle where Luther translated the Bible into German." Good overview of the country. We saw large cities as well as charming small historic towns. "I loved the Rhine River cruise. But the most impactful sight was the Bergen-Belsen Memorial." "For me, this tour was a series of "how could they?" moments. Everywhere we went, the dark stain of the Nazi years lay over what I saw. Hamburg and Dresden's destruction, the stumbling stones and concentration camps, the Documentation Centers in Munich and Nurnberg, the bunker site and memorials in Berlin, stories told by guides about murdered family and neighbors... awful. The East German oppression witnessed of the end of the tour added to my gloom. Like Ludwig II, I wanted more fairy tales." It was a beautiful tour but also informative. I did not know much about the German history and how young it was as a country. And it was quite thoughtful in dealing with all the things in the 20 th century. "I loved the small villages. Mundane was a favorite but I think it was the guides personal stories of their family living in Germany through the War and the Cold War." I knew what to expect in general from our trip to Greece last summer, and I was not disappointed. Carlos was a wonderful leader. He kept us organized, shared with us his impressive knowledge about European history, and told us his personal stories that related to our various destinations. The local guides were also interesting and well-informed about their towns. "I loved seeing the desk where Martin Luther sat as he translated the Bible into German." "The Turkish dinner in Berlin with a local Turkish guide." It was great to see and learn about Germany, from the big cities to the smaller towns. Our guide, Carlos, shared his experiences, making the lessons of the division/reunification of Germany that much more vivid. Some days were long as we were on the coach for 6+ hours, which meant we got into some towns just as the sites and shops were closing up. Great for wandering around looking from the outside, but left me wanting to see more and sad that there wasn't time. "Loved Hamburg, especially the "Planten un Blomen", and also Erfurt was lovely. Also, Rothenburg's Night Watchman's tour was a highlight. In Berlin during free time, I went to the Pergamon Museum, but was disappointed that the Pergamon Alter exhibit was closed due to remodeling (will reopen in another couple years), but was blown away by the Istar Gate." Overall, the tour guide, Carlos, was excellent. The driver was very personable and helpful. The hotels exceeded my expectations. The meals were great. Some of the tours were not all that insightful. Riding on the bus was pleasant, but took too much time. A faster means of transportation would leave more time for touring. "Tour of Berlin with Jim and his explanation of the Nazi regime and life under the Communist regime." Though I had seen a number of the attractions on this tour (Cologne Cathedral, Rothenburg, Munich, Neuschwanstein), I still enjoyed this tour immensely. Seeing the "Let's Go Modern" Hamburg contrasted with the "Let's Redo The Old" Dresden showed the two ways Germany has used to recover from WWII. Carlos' daily historical and personal talks brought the country's history to life and, as in all our previous Rick Steves tours, my fellow travelers made every day enjoyable. "The chance to see Berlin was the prime attraction for me on this tour and it did not disappoint. I wanted to see all the sights that I have read about - Brandenburg Gate, Holocaust Memorial, Pergamon Museum, German Historical Museum, and German Bundestag - and all were fascinating. Staying in old East Berlin and seeing the transformation was also really eye-opening. I especially liked our Berlin Tour with Jim, who brought a lot of the city to life." The overall experience for me was top knotch! We did and saw and experienced more than i can even say! Our guide Carlos was incredible. He went out of his way to make sure we all were having a great time and that we all had what we needed. There were so many unexpected treats along the way! "Hard to answer! Seeing the perfect small German town like Bacharach, and Rothenburg, the quaint hotels where i opened my window and saw the whole town!! Or the very sobering visit to Bergen- Belsen where we learned so much. Also very much loved Berlin and our tour there was so insightful." I enjoyed all the stops on the tour especially Erfurt. "see how much Berlin has changed in 12 years." We did the 13 day Best of Germany Tour. Our tour guide Fabian, could not have been better. He was so knowledgeable about Germany's history and culture that it was a pleasure listening to him speak. "I loved the Neuschwanstein castle as much for the beautiful mountain setting as for the castle itself. I also really enjoyed the Rothenburg Night Watchman tour." Great tour. Since my ancestors (and DNA) are all German, I really looked forward to this trip. There was a ton of information. It certainly enhanced, as well as changed, my perceptions of Germany. I want to go back! "The Zwinger Palace/Museums in Dresden. I was totally unprepared for it. Dresden was a charming town. I would have Iiked more time there. The Munich Octoberfest was a real eye-opener, so much bigger than I had imagined!" This was a very enjoyable experience. The tour was well organized and the guide was excellent. We traveled with a very nice group of like-minded people. The overall result was pretty much what we expected from a Rick Steves tour. "My "wow" moment was observing the throngs of people headed in to Oktoberfest, not to mention the crowds that were already in attendance when we arrived at noon." "We were dropped off in Dresden next to a lake. When we walked about a block, we came upon the Zwinger Palace and the bridge to the entrance, highlighted by what looked like a crown atop the archway. We then walked into a large quad, equally impressive." "Actually, my first wow moment occurred the first night of the tour. My friend and i were the only ones in the room that hadn't taken a Rick Steves' tour. Several people were on their 12th, 13th and 14th trip. Guess we have a lot of catching up to do ! I really can't pick just one wow moment, as they happened daily. So much to discover in each and every place we visited. Simply amazing." This tour does a very good job of allowing one to experience a number of the different pieces that make up Germany. I signed up for this trip because it does cover a number of parts of Germany. I didn't realize at the time that is is a new tour. "To me, Germany doesn't have the "wow" places that other countries like France, Italy, or Greece have. But there was a "wow" feature of this trip. Our guide, Fabian, shared so much of his own background, knowledge of his country including the government (we were there at the time of the elections) and thorough knowledge of Germany history to make this trip very special." Fabian was an outstanding guide. He was personable, friendly, considerate, patient, honest, and extremely interesting as he shared his experiences and knowledge of his country. His personal and dual perspectives of Germany gave us so much insight into the cultural strengths and weaknesses. He shared his life and love of Germany. Above all he gathered all of us in and became a part of our group, instead of being just our guide. I'll never forget his friendship and genuine kindness. "I don't know that there is one. The entire trip was just great all bundled together to make one single "wow" experience." "Sitting in a tent and drinking a big beer at Oktoberfest"
I have visited some of the cities before. With the help of your guides'knowledge, I was able to learn more about each city. Fabian and Caroline were great explaining the history of each place we visited. Walking tour guides were able to add a vast amount of knowledge to enhance our city walk arounds. Some of our fellow travelers felt the bus time was too long, but I think our guides did a good job explaining about each area we traveled through.Thank You for providing this tour for us to enjoy. "To visit Germany was a WOW moment. There ls so much history that the guides were able to impart on us and make it interesting at the same time." I really liked the progression of stops on this itinerary. It would have been nice to spend more hours in Rothenburg. Fabian's knowledge and presentation of the information were outstanding. There were some long days with a lot of information, but the guides made it smooth and interesting every day! Each stop was unique, and it was an enjoyable history lesson all the way. Thank you for creating this trip for us all to enjoy! "The entire trip was "wow." History came alive, thanks to our guides!!!!" A wonderful overview of Germany. Hotels were top-notch, and the breakfast buffets were wonderful. I am already looking to see what my next tour with Rick Steves should be! "My wow moment was when Fabian told us the history of his family and WWII. I realized, that just about every family in Germany probably has some kind of "History" with that time period. The Great-Uncle Hans story was great!" Our tour guides and bus driver were excellent. The guides were knowledgeable and user friendly. The pacing and the amount of "free" time were welcomed. "The final meal was outstanding! I really enjoyed the smaller cities and the Rhine River excursion. The "Night Watchman" was outstanding." Excellent tour. Well organized and orchestrated. "Loved the look, feel and history of Berlin." I very much enjoyed the Germany tour. The group was cordial and considerate of the rules of travel. I saw some amazing views and enriched my knowledge of Germany's role in European history. Hotels on this tour were consistent with past RS tours I've taken. The tour was aggressive in terms of the area covered. I'm not sure what I would do to change it. For me, a castle or two and a cathedral or two is plenty. That being said, the Cologn Cathedral was awe inspiring as was Neuschwanstein Castle. "I didn't really have one wow moment this time. The Cathedrals are always breathtaking although I say I've seen too many. I will contemplate my trip for a long time as several ancestors immigrated from this beautiful country. I will take advantage of the list of books and films supplied by our guides. I looked forward to the onboard talks by Fabian and Caroline." This tour was truly outstanding. What a great way to experience an overview of the best Germany has to offer. The tour guide was outstanding and facilitated an unparalleled experience through his knowledge of German history and the current political and economic environment. The longer travel days were broken into shorter segments with visits to Cologne, Speyer, Nuremberg, Wartburg, and Dresden - - bonus stops! "I was truly wowed by some one-on-one time spent with Fabian when I asked him to describe the "fall of the Berlin Wall" on Nov. 9, 1989. He was a west Berlin resident at the time and he provided a detailed summary of his involvement that night. He also had many stories about individual West and East Berliners and the Soviet guards. He painted a very vivid picture with details I had never heard before." I thoroughly enjoyed the tour. It was rigorous with a lot of travel, moving, walking, but so worth it. I especially appreciated all of the knowledge and information we received from our tour guides. They are both excellent. I also enjoyed the hotels and restaurants. I felt the tour was very well organized and well thought out. "Seeing Berlin in its present state of recovering and rebuilding from the impact of WWII. Quite an eye opener to see such a vibrant city now." I really wanted an educational experience, and I got it. During this 13 days, we learned about everything German: history (lots of this), culture, politics, architecture, music. There were many wonderful sites, well chosen, but I most appreciated the serious attention Germans are giving (and the tour gave) to discussing the Nazi period. As a Jew, I have long been reluctant to visit Germany, but I leave with tremendous respect for how the country in courageously facing its dark past. "I probably enjoyed most the village of Bacharach and the Rhine boat ride." The small towns, Bacharach, Rothenburg and Erfurt, were delightful with great places to sample beer, kraut & sausage! The Rhine trip was lovely and it was very interesting to see wind generators and solar panels throughout the countryside of Germany. "The Jewish Holocaust Memorial in Berlin was overpowering and thought provoking. Also in Berlin, seeing the Brandenburg Gate alive and well without Russian soldiers guarding it was a big wow!" I could not have been happier with the cities, sights, hotels, and tour guide you included. This was my dream vacation and first time traveling outside the states. I've always wanted to see Germany and your all Germany trip, combined with the 500th anniversary of the Reformation just made it a must do trip. Our group dynamic was exceptional and we had fun! Our guide, Torben, was outstanding; always informing,teaching, & surprising us with local treats. "Probably Bacharach and St Goar on the Rhine. It had it all! The Rhine, the castles and going into Rheinfels Castle, the vinyards and wine tasting, the boat cruise, and our meals those two nights were just as good as it gets. And I purchased a Cuckoo Clock! The other Wow moment was seeing the Wartburg Castle and walking into the room where Martin Luther translated the Bible from Latin into German. Goosebumps." This was my first trip to Europe. Even though I was excited and had read a lot, I was still somewhat skittish about the trip. I just decided that I was going to do it and experience everything I could. I came in two days early and explored by myself. Everyone in the tour seemed to get along very well right from the start. I liked the fact that we did things as a group and were encouraged to do things on our own. "There were so many "wow" moments. I guess my favorite moment was seeing Bacharach. It was beautiful and how I pictured Germany." Beautiful country with a rich history, clearly articulated by well-educated guides, nice and very clean hotels, lots of geography, good food and wine, and a friendly group of travelers ... it was a good time! "Okay, we saw prettier things, but honestly, the thing that astonished me was those gigantic container ships, the size of the cranes, and the speed of sorting the cargo in Hamburg Harbor." This tour was so much more than I expected. I loved getting to travel w/my dad (his 1st time to Europe) & to be able to see parts of the country his family came from was very special. Our guide & tour assistant were essential to the quality of this tour. Our group was lovely, we all got along. The mix of towns & cities, places I might never have visited on my own are what make RS tours awesome. This may be the wettest/humid summer in German history but I wouldn't trade my memories for anything. "I'm so happy to be in Europe that everything is "wow" to me. The opportunity to be somewhere new & different, maybe a little familiar but still different is exciting! The food, music, architecture, landscapes, history, art, customs, conversations, mishaps/mistakes, etc. are all WOW if you choose to experience them as such. I didn't realize I'd had any, but I was "wowed" by how my preconceived notions of Germany (past & present) were replaced w/thought provoking experiences & wonderful memories." This second trip with RS was as good as the first. From sign up through end of trip, all was well done. It was a nice group, as before, and as before you gravitate to certain people but had good conversation with all. This was a very nice see, taste, and feel of Germany giving me a better understanding of the country my ancestors immigrated from. All of the stops were interesting and seem well chosen for the tour. WWII history was very good as I grew up in the generation after the war. "Good question, impossible to choose as different places had wow. Bacharach and the Rhine/castle cruise probably was the most memorable. I liked Hamburg and Munich more than Berlin but all were good. You have to see Neuschwanstein and the Hofbrau, the Documentation Center at Nurnberg and Zeppelin field. Erfurt was a highlight as I grew up Lutheran, and was able to meet distant cousins there that had grown up behind the Iron Curtain. It was all wow to this Texas kid." Our tour was all I had hoped for, and more. The group members were friendly, courteous, & amiable, and we became a cohesive group quickly. The itinerary was well-planned and included "essential" things to see. I felt safe during our travel abroad; I am totally sold on Rick Steves' Tours. "Walking in Luther's footsteps was my favorite experience as we explored Erfurt and Wartburg. But I must include the Rhine Valley River Cruise as a spectacular activity! Bergen-Belsen memorial, the Zeppelin Field and Nazi Documentation Center, and Nazi sights in Berlin were sobering yet highly educational-a must-see. I was very impressed with the unusual Elbphilharmonie concert hall." This was a wonderful tour of Germany. A lot of territory was covered, giving a sense of the breadth and diversity of the country. "The beauty of the countryside and the charm of the cities and villages." This was my fourth Rick Steves tour and it was consistent with each of the others. Our guide Torben is extremely well versed in German history and culture. He is both well spoken and articulate. He took the time to learn about the personalities and interests of each tour member and did his best to meet each's individual needs. As advertised, it is a very active tour and the travel from location to location was enhanced by Torben's talks about history, culture, and his own life in Germany. "My "wow" moment is not a single location like seeing a Roman road in Cologne (or its cathedral), the walls of Rothenberg, medieval and quaint Erfurt, revitalized Berlin, World War II sites, or the castles along the Rhine, but rather the conglomeration of the entire tour. The sights and experiences are so many and varied it is hard to believe we saw so much and learned so much on a 13 day tour, that the entire trip is my wow moment." This was a terrific tour! I loved it! I learned so much! "Woo I loved the city of Erfurt. It was such a lovely place." Carlos and Maisie, with help from local guides, gave us a tour that was "best". They were thoughtful, informative, and helpful. We learned much from their backgrounds and experiences, and introduced to many interesting and moving sites. "We had many "wow" moments. Visiting former East German sites and their personalizing of the sites by Carlos and Maisie. The Pergamon and Zoo in Berlin. Riemenschneider's wood carvings." "Just arriving in Hamburg and knowing this is where my grandpa came from was a WOW moment even before the tour started. Seeing the Neuschwantstein Castle was my WOW moment. It is beautiful and enjoyed the picnic lunch by the lake. I enjoyed the walk up the hill and the view from St. Mary's bridge." "Should have been visit to Reichstag in Berlin but it poured rain! Still, thanks to Carlos for arranging it!" Excellent guides, wonderful bus driver, they worked together flawlessly, they adjusted to many scheduling changes, which they managed to enhance the tour. This is new tour that has some timing and scheduling issues. My previous tours (16) use early morning with an intensive schedule then most afternoon "on your own" to enhance the tour. This tour has several "full" days, which I found exhausting. "There where several. For me just looking back on the whole tour experience it was too find and experience how effective and throughly the German people are confronting their "horrific" Nazi past. The Documentation Center in Nuremberg was moving and overwhelming detailed in effectively organizing,, showing, and documenting through movies, pictures, and actual documents the very evil nature and atrocities of that 1930s to 1945 period of German life and what was inflected on the entire world." Enjoyed the stories from our tour guide, informative. Trip logistics were smooth. The bus driver seemed to know the best routes and places to drop off. Good choice of sites. Loved that we did not have a group of 50 people. 20-25 is a good size for getting around on the public transportation, city walks, etc. It also may encourage more mingling between people. "The view from my hotel in Rothenberg was so spectacular as was the whole walled city and countryside." Overall my experience went well. There was enough time to do your own exploring and enough structure from the tour. Our lead guide made a superb effort in tailoring to the needs of my tour experience and the experience of others. His knowledge of history, culture and David Hasselhoff was in depth and easy to understand. When I wanted to branch out on my own our guides gave me advice on transportation and hurdles I might expect. The pacing of the tour was also a plus of the tour. "Visiting the Olympic Park and Allianz Arena in Munich on my own and finishing the day ont the observation deck of the Olympic tower overlooking the city landscape with a rock concert below and fireworks in the distance. With the group it would have to be listening to German pop/rock songs on the bus and walking through the Brothers Grimm fairytale forest followed by our group name game and shots of German liquor in the woods." The best of Germany tour was an amazing experience. It was the perfect balance of structured activities and free time. The hotels were great, small "mom and pop" type places with friendly staff and great breakfasts! Carlos and Maisie were such joyful professionals! They were knowledgable and fun. They were able to navigate us through some tough times in German history with grace and sensitivity. They also created many fun experiences for the group as we dove into German culture. "The sights, sounds and tastes of Bacharach - WOW!" Between Carlos and Maisie, I learned many facts about the background and history of the Country that I wasn't aware of. Carlos presented the issues and background regarding Nazi Germany in a sensitive and informative manner with true respect to the tour group as an audience. Maisie gave her perspective as a Great Briton transplant and the issues she faces in Modern Day Germany - both positive and negative. Both guides were very helpful in all ways possible. "My favorite "wow" moment was doing the Name Game in the Black Forest while doing shots of "gold" liquor." Had a great time. Accomplished goal of learning quite a bit of German history, particularly the perspective of the tour guides on life in East Germany. Tour provided excellent sampling of cities, towns in Rhine valley etc. Guides were very helpful. Tremendous effort and assistance to a tour member who broke her leg, and needed to return home. Loved the small medieval towns. Wish we had more time there. "Gathering in a group, and the walk thru the forest." it was an amazing trip. I love World War II history so having two history experts as guides was a real plus. Both Carlos and maisie shared their stories. Long bus rides seemed shorter due to awesome scenery and history lessons. Both were generous in answering our questions. "Several wow moments. I loved the night watchman tour in rotenburg, even though I'd done it previously. The hofbrau haus was fun as we were encouraged to make new friends and maybe buy them a drink. We did this and it was fun. We felt like real rick steves travelers. We took a wrong bus turn so we missed our break stop exit. Driver found a charming place that I think we ended up liking more. We felt like we were on an adventure and we are rick steves travelers so we don't grump!" This tour, our seventh, was outstanding! It was a new itinerary but we could tell that a lot of thought had been put into it. Overall the accommodations and included breakfasts were excellent The local guides were very good. The tour with the Night Watchman in Rothenburg was not to be missed. Rick's mantra "small groups, great guides, no grumps" describes our tour perfectly. "We were on our own for an hour or two in Dresden. When we returned we found that there was a party going on! It was the Fourth of July! Holger and Robyn had decorated our meeting place by the lake with red, white and blue balloons and streamers. There was cake with candles. We lit sparklers and listened to Fourth of July music." The tour was amazing, we got to see so much and do so much in a short period of time. It was very well put together. Our guide Hogar had a great enthusiasm and passion for his country and what it had to offer. I really liked the variety of activities on this tour: from a walking tour of Hamburg to a walking tour of East Berlin, from medieval cities to modern cities, exploring very old buildings, to the brand new Elbphilharmonie in Hamburg, to a rebuilt Dresden cathedral! "I really liked the view from Queen Mary's Bridge near Neuschwanstein Castle. The wow of the tour was the beauty and diversity of Germany." "I believe I like Hamburg and Erfurt the best . Hamburg didn't know it was in East Germany but the town it self was great. Erfurt learning more about Martin Luther was great we had been to Wittenberg. where Martin Luther done lot of writing. I didn't know that Martin Luther had six children and married twice"
We were very pleased with the overall tour experience. We appreciated the materials that we received before we left the U.S., which were very helpful in preparing for the trip. The tour was well planned and well organized, with so many details having been thought through carefully. We came away from the tour with a better appreciation for and understanding of Germany, both today and historically. The audio devices worked well. "There were many special experiences. We were very interested to have time in the former East Germany. We enjoyed both Erfurt and Dresden and were fascinated to learn more about life behind the Iron Curtain, and about the challenges and successes of reunification. Thanks for the 4th of July celebration!" I had a great time - I was initially a little wary about going on a tour, but chose a Rick Steves' tour because of the small group size. However, socializing with my fellow tour members was one of the most enjoyable aspects of the trip and really enhanced my travel experience. I thought that the group activities were well-planned and all of the local guides were excellent. I appreciated our tour guide, Holger, giving us suggestions for activities and restaurants for our free time. "My favorite "wow" moment was walking through East Berlin and thinking about the fact that 28 years ago, it would have been a vastly different experience. It was surreal seeing Checkpoint Charlie turned into a tourist attraction. All of the trip through the former East Germany was full of moments like that - Holger did an awesome job putting the events surrounding reunification into context. He brought up several excellent points that really changed the way that I thought about the event." "Visually, the view of Neuschwanstein from Mary's Bridge, Frauenkirche in Dresden, and the charm of Rothenburg and Erfurt. I think I was most 'wowed' by the spirit and determination of the German people. It is truly amazing that they were able to rebuild their country twice (WW ll and post communism) in the 20th century." Very nice trip with lots of history and interesting sights. A little long on the bus at times, but that should be expected with the heavy agenda of the trip. "The guide in Bacharach. Wonderful history and significant personal touch to Nazi period and life in a small town." Torben, with the assistance of Fabian, did a fabulous job of leading this tour. The extent of his knowledge of Germany, its history, and associated subjects is truly impressive, as is his ability to convey that knowledge. Having never been to Germany before, I felt that it was a good introduction. It felt rushed at times, but that was necessary to provide complete coverage. Based on the tour, I would definitely visit Germany again in the future. "The walled city of Rothenburg was my favorite moment of the trip. In fact, I wished that we would have spent a couple of nights there instead of just one night." "Baroque church @ a rest stop." It fully met my expectations. I was able to see and do just what I had intended. The tour group was very congenial. I don't believe that I learned enough about how life for an ordinary German family differs from American life. Somehow I really can't say that I "know" Germany though I "saw" Germany. "Seeing Neuschwanstein castle[INVALID]-from a distance. (I was not so impressed at the interior as we were in a large group and were rushed through the rooms)." Our guides are very knowledgeable and helpful. All hotels were at great locations, comfortable and had very good breakfasts. This tour is a good overview of Germany with big cities and medieval towns. We visited many beautiful churches and castles, and had a cruise on the Rhine. We also visited sobering sites like the war memorial, concentration camp, Nazi sites...etc. I learned a great deal about the history of Germany. My only complain is sometimes I feel a bit rushed. "I don't have a favorite wow moment. The most scenic part was the Neuschwanstein Castle area, but since I have seen many pics of it so it was expected." This was my first visit to Germany and I am so glad we had a tour dedicated to just Germany. It has a complicated history, some of which we all know, but our guide, Torben, along with his "apprentice," Fabian, were very skilled at relaying, many more interesting and important details of historical and contemporary Germany. We loved them both. Making a circuit of the various distinct areas of Germany was fascinating. I was especially interested in visiting cities in the former East Germany. "I was very impressed with the way Germany has put money and effort into restoring much of the architectural beauty and historical detail of cities like Erfurt, Dresden and Berlin since the fall of the Berlin wall. I expected to see many more remnants of soviet occupation drabness, but it was not so. It was a sobering "wow," but the stops at Bergen Belsen and the Nuremberg Documentation Center including a stop at Hindenburg field, made a lasting impression." This tour had a relentless pace...not unexpected. It was just what it was written to be. However, we had very little free time anywhere. We spent a lot of time on the bus and traveled long distances so it was frustrating when we got to most of the small towns, we rarely had much time to enjoy them. We always had walking tours which were informative but the one in Bacharach was difficult because it was at the end of a long day, it was hot, and we had so little time to enjoy that cute town. "The people were the best. Our two guides, the tour members, the German people were my favorite part. It was lovely to spend time with friendly, respectful people from many different places." True to Rick Steves' standards, it was a wonderful tour! It was well orchestrated, seeing as much at each location as could reasonably be handled, clean comfortable bus with a very skilled driver, knowledgeable and always-accessible tour guides, well-situated hotels, congenial and interesting travel companions, and with just the right balance of group activities and independent exploring. "Although there were many many beautiful sights to dazzle the eye, the one that sticks out the most in my memory is the Elizabeth Chamber at the Wartburg Castle. The room, dedicated to Saint Elizabeth of Hungary, who had lived in the castle, was made of vaulted ceilings and walls completely covered in tiny glass tiles. In spite of castle dimness, the mosaics glowed and sparkled as I looked at each panel beautifully depicting scenes from her life." This was our first Rick Steves tour and our first time in Germany. I cannot say how much I enjoyed every minute of it. We covered so much of Germany and our guides were wonderful. They made sure we had ample time to visit each site and took care of any issues before they even came up! It was wonderful to share our adventure with our fellow travelers and we made some new friends. It was such a treat to have everything taken care of and our enjoyment was paramount to our guides. "Hard to pick just one, but Neuschwanstein was just amazing. Wurtburg Castle was stunning and the Luther exhibit was probably my favorite part of the tour. I was especially impressed with they way the bus rides were broken up with stops. Instead of wasting time at rest stops, we visited important sites such as Cologne and Dresden,places that we did not need a whole day to see. It made the trip so much more pleasant and the bus times more bearable." I learned a great deal about the history, culture, and uniqueness of the German people. Our tour guides Carlos and Torbin were great. They organized everything well, keep us informed and educated us on the culture of the German people. I also loved the diversity of seeing big cities like Berlin, Munich and Hamburg and then smaller cities like Bacharach, Erfurt and Rottenberg. I really enjoyed spending time in Erfurt where Martin Luther studied and became a monk. "I would say the sight of the uniquely designed Elbphilharmonie in Hamburg." Great tour w/excellent and knowledgeable guides (nice benefit to have 2 experienced guides!). Enjoyed a wide range of history and culture from Roman through Medieval/Royals to Reformation to WWI / WWII and Soviet East Germany / Berlin Wall. Lots of cathedrals, churches and castles including lots of uphill and stairs. Nice mix of planned events and meals with free time to do what we wanted. Enjoyed diversity of large cities to smaller towns. Some challenges w/unexpected Autobahn traffic. "Hard to have a single moment, but probably would have been beautiful scenery in Bavaria and Neuschwanstein Castle. Enjoyed "Sleeping Beauty" castle and our nature walk where we sampled local goodies to celebrate a tour member birthday. Another fun event was watching soccer match on television where our guides were supporting opposing teams. Lots of fun and friendly banter throughout the game and during the trip. Had as much fun watching Carlos(Dortmund) & Torben (Frankfurt) as the game." We were pleased and impressed with the quality and quantity of interesting and memorable sites that we visited. Most of the time the group seemed to move at a fairly rapid and deliberate pace (we typically walked 7+ miles per day); but we were not surprised at this, as it was clearly advertised as a physically active trip. All hotels and restaurants that we visited with the group were very good. "During the tour, the visit to Neuschwanstein castle and the Soviet war memorial in Treptower park. But the two most impressive and memorable sites were ones that we saw on our own; the Residence in Munich and Potsdam." T Germany tour was a fun learning adventure! This new itinerary included a broad variety of experiences which helped to understand Germany's history and current culture! Visits to Wartburg Castle and Erfurt during the 500th anniversary of the Reformation, gave perspectives on the influence to the German language and everyday life besides the changes in religious practices. 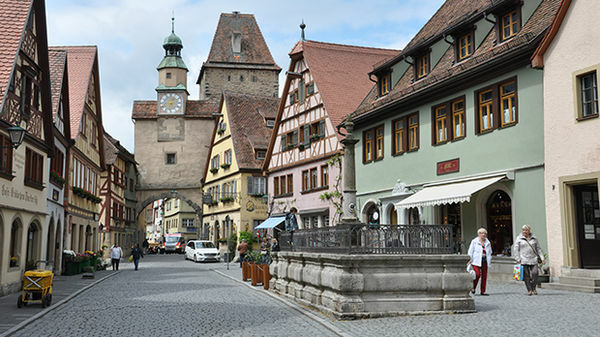 "Strolling through the historic lanes in Bacharach, Rothenburg, and Erfurt." Loved the richness of the sites we visited. There was so much variety -- cities, both modern and medieval, churches, memorials, historical exhibits. The local guides, as always, were excellent especially when they told personal stories. Carlos and Torben gave us so much historical and current context that I felt we had a mini-course on Germany which enriched our experience. Fellow tour members made the trip lots of fun. "Hard to pin down one moment. I think the visit to Bacharach was my favorite from the "quirky/charming" hotel to the Rhine boat trip and the castle ruins it was a great day." It was fabulous!!! I can't say enough about Carlos and Torben. Fantastic guides--interesting personal touches with their family stories. Great surprise visit to the Soviet war memorial in the old East Germany. They were of great help when I left my phone in Rothenburg. I felt they took excellent care of us. I only wish the tour was a little longer--17 days perhaps??? It was even better than I had anticipated. Highly recommend. "Anything and everything that had to do with WWII. I am very interested in that war and they and the local guides covered a LOT of information. I'm sorry I can't pick just one thing." I was impressed by the series of sites we visited and the value-added info that our two guides provided. We kept moving to see Germany in two weeks and a wide variety of different types of places. I would recommend this tour and especially our two guides. They prepared us to be independent and explore on our own. It was fun to hear what others learned and saw. "The surprise stop at the Soviet War Memorial was emotionally very moving. i just wish we could've done something similar for the allies, particularly since we were there on Memorial Day (which passed we nary a mention)." This was our first tour ever. We have friends who told us how much they enjoyed Rick Steves' tours so we tried it. I had little expectation for what we would experience and boy was I surprised by what was offered to us. Every aspect of the tour exceeded my expectations, and more. Even though this was the first tour of the Germany tour, it ran smoothly and was enjoyable all the way. The Tour Guides, Holger and Carlos, were such a good team, they gave history, humor and caring. "I just loved the two days in Erfort. It felt like we were in an "old country" city. We had a good amount of free time and explored and tried out our German language with the local people. We had dinner in a restaurant that spoke no English so we really were emersed. Loved it! Also loved the Harbor Festival and boat tour in Hamburg. Beautiful weather and got to see how people celebrate in Hamburg." Fantastic, start to finish. The trip met - and even exceeded! - our high hopes and expectations:) Just 1 comment - I understand the financial rationale for having increased tour size up to 25. But if we had not had a 2nd guide (Carlos Meissner, who is excellent btw, more on him below!) - well, at full tour size, and with the mix of people on this trip, it would have been hard to have time for more than a passing occasional question to a single guide, no matter how great the person. "Two WOW moments - 1. Hamburg city tour including the new symphony hall & the harbor boat ride, with special luck timing to be there on the weekend of the annual port anniversary celebration 2. Berlin, at the Holocaust Memorial AND at the Berlin Wall Memorial. The 1st we visited during our city tour; the 2nd we visited on our own." I enjoyed most of the places that we visited on the tour, except the Sleeping Beauty castle. Carlos was a fountain of historical knowledge about Germany, while both Holger and Carlos gave us an insight into how Germany works today and would always answer all of the many questions that were asked of them. I learned so much about Germany, then and now. "The boat tour of the Hamburg harbour during the Tall Ships Event on May 7. The harbour itself is interesting to see, but with the tall ships in port the tour was exceptional." We found the tour very enjoyable and enlightening, especially for anyone with an interest in European history. The choice of locations and narrative given by the guides really made me come to a new appreciation of what the German people have come through and are continuing to deal with. The guides' instruction and encouragement to explore on our own was great. As a result we attended a "Turmcafe" at St. Jacobi church in Hamburg, which was an unforgettable experience. "I was particularly struck by the grandeur of the Frauenkirche in Dresden, and the story of its reconstruction with help from across the world." The heart and soul of Germany! It is what I wanted to experience. I did,in spades, on this tour! "My first view of Bacharach!" 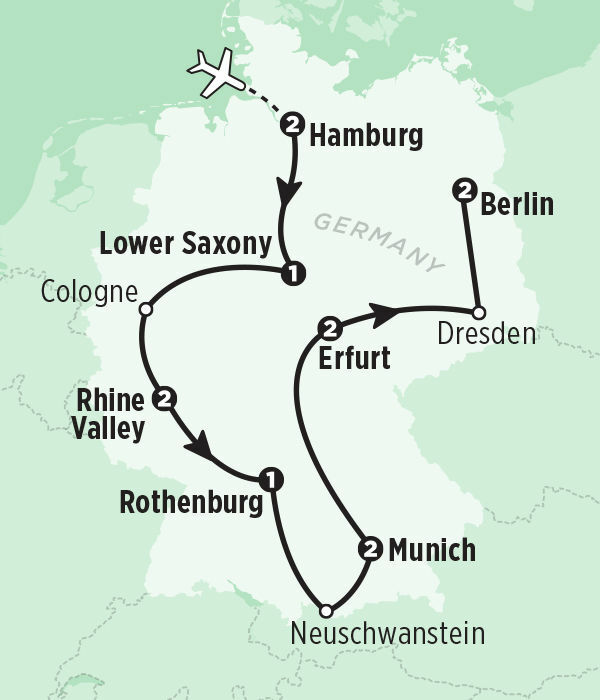 A wonderful, informative, scenic tour around Germany from Hamburg in the Northwest to the Alps in the Southeast!. I love the history-from celebrating the 828th anniversary of the "New Harbour" in Hamburg to the neighbourhood of the Grimm Brothers, "mad" King Ludwig's Castles to the darker history of the first half of the 20th century. To visit Germany is to see juxtaposed the brilliance of musical, literary, and intellectual giants with the potential for evil inherent in humans. "Perhaps less "wow" than profound - visiting Bergen-Belsen and the Nürnberg documentation centre. In the first gaining and understanding of what "DP"s were -displaced persons removed from their homes, families,j obs and sent to concentration camps, often to die. In the second, understanding a bit more about the social and economic conditions that gave rise to Hitler and chilling seeing a parallel to the emergence of far right movements in the world today." I learned a lot of Germany's history, culture, etc. Enjoyed the tour very much. "Learning about the region of Germany my family is from." Most tour members arrange to fly into Hamburg and out of Berlin ("multicity" on flight-booking websites). Booking round-trip to one city will require a connecting flight, train trip, or additional overnight stay in Germany. We suggest arriving a day or two before your tour begins to allow ample time to get over jet lag and be well-rested for the first few days of your tour. For more information about transportation options for getting to and from your tour, see your Rick Steves Germany guidebook.